Fs where you go from $10 million to infinity and beyond. Russell and other speakers at the event showed us EXACTLY how to get from ZERO to 6-figures, 7-figures, 8-figures and beyond. Unlike other events, Funnel Hacking Live is a cohesive journey – Not a jumble of speakers packed in to make it seem like a good deal. So when you get the notes, you’ll have a clear path to follow that takes you where you are today to a 7-figure online business and beyond. The man who needs no introduction has empowered more than 50 Million people from over 100 countries to lives full of abundance. Last year, Tony’s session was life-changing, and this year it’s bigger, and even better than before, and we got notes on everything Tony talked about during this 3-hour transformational journey. Arguably one of the BEST online marketers of all time, Russell Brunson covered a new topic each day of the event, and we got notes from all of his sessions. 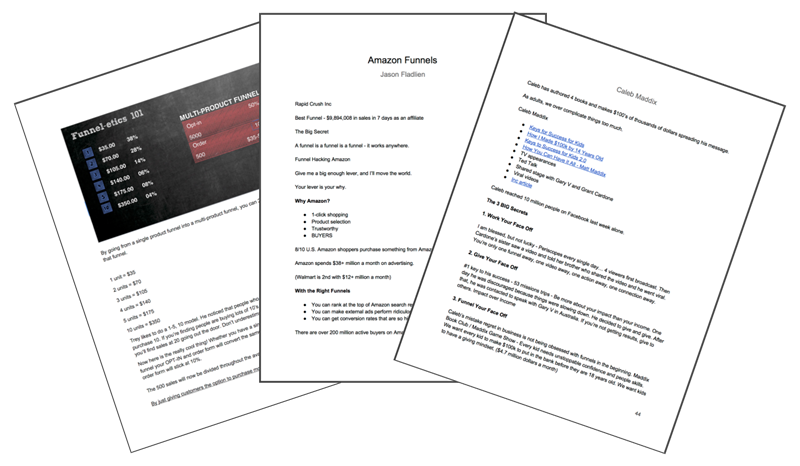 Known as the Webinar King of the World and #1 Affiliate Marketer of all time, Jason Fladlien has generated over $10,000,000 in affiliate commissions alone for the Amazon Selling Machines launches. The networking, the time at dinner, and even ESPECIALLY the time spent hanging out at the bar. Deals are made, some of the best information from the entire event is shared in these unscheduled meetups, and anything we pick up, we’ve included in the notes. Because we get notes on everything, it’s just like you’re right there, rubbing shoulders with the best marketers online, and having them tell you EXACTLY how they got results so you can get the same results for yourself. Every single speaker has a unique story and a step-by-step method for how they’ve been able to achieve amazing results. How to get all the traffic you could ever want for you funnel in just 3 days… In many cases, this traffic is 100% FREE… all you have to do is decide how much you want!